BioZyme has expanded its rapidly growing VitaFerm HEAT brand to include a new 200 lb. 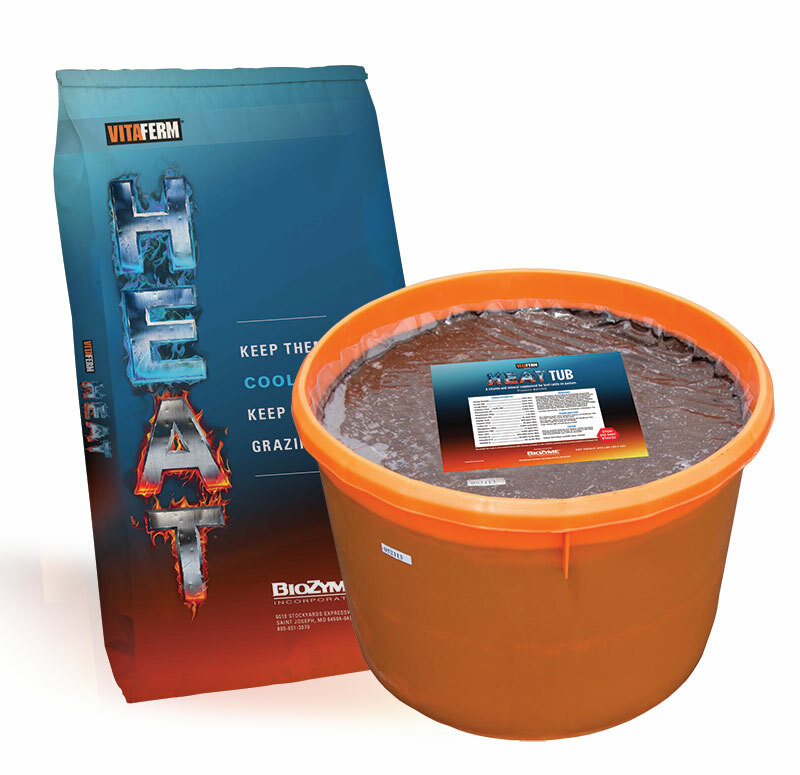 HEAT Tub and loose mineral containing CTC 3G to aid in the prevention of anaplasmosis, an infectious blood disease spread by parasites that causes severe anemia and weight loss in cattle. Previously only available in a loose mineral, VitaFerm HEAT is a natural vitamin and mineral supplement used to reduce heat stress during temperatures of 70 degrees and above, or any time cattle are grazing fescue. While fescue may serve as an abundant and hardy forage for cattle to graze, it can contain a fungal endophyte that is actually toxic to cattle and can interfere with the animal’s ability to cool itself, causing heat stress, weight loss and reproductive complications. Scientifically formulated, VitaFerm HEAT provides the correct balance of required minerals and vitamins to compliment summer forages during lactation and to maintain overall herd health. With the addition of BioZyme’s proprietary Amaferm® advantage – a natural feed additive that acts as a prebiotic to increase digestibility and maximize the energy value of feed – VitaFerm HEAT has been research-proven to help cattle maintain performance during heat stress and improve forage digestion and microbial growth within the ruminant system, which is often severely compromised by fescue. Additionally, VitaFerm HEAT contains XTRACT 7065, a unique blend of clove, cinnamon and chili peppers (Capsaicin) to help maintain circulation to support animal performance in both heat and fescue grazing situations. The combination of Amaferm and Capsaicin lowers body temperature, which can help improve conception rates and maintain pregnancy. Garlic added to the formulation acts as a natural insect repellent. Oklahoma cattle producer Duane Jeffrey said he has seen a huge difference in his cattle’s behavior and appearance since feeding them VitaFerm HEAT. For more information about VitaFerm HEAT, visit www.vitaferm.com/products/vitaferm-heat/.